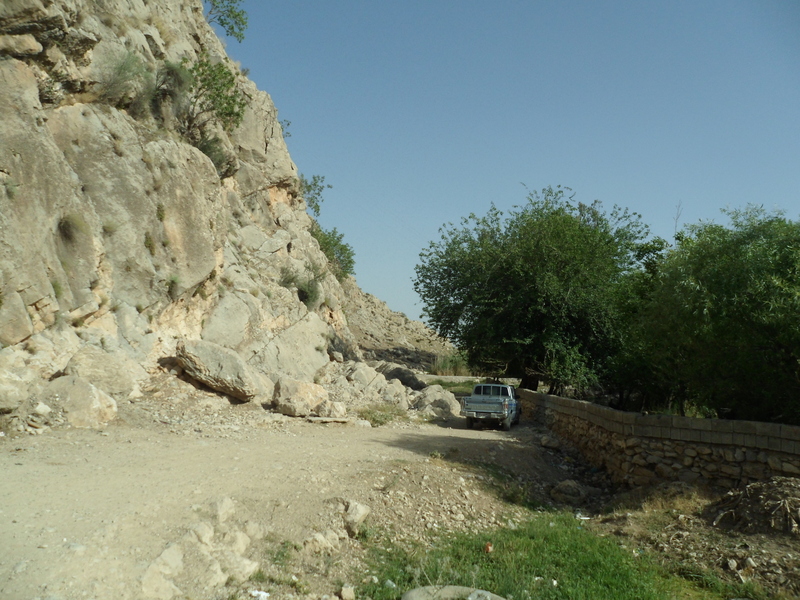 On the road to Shiraz there is a little village nestled up against the cliffs. 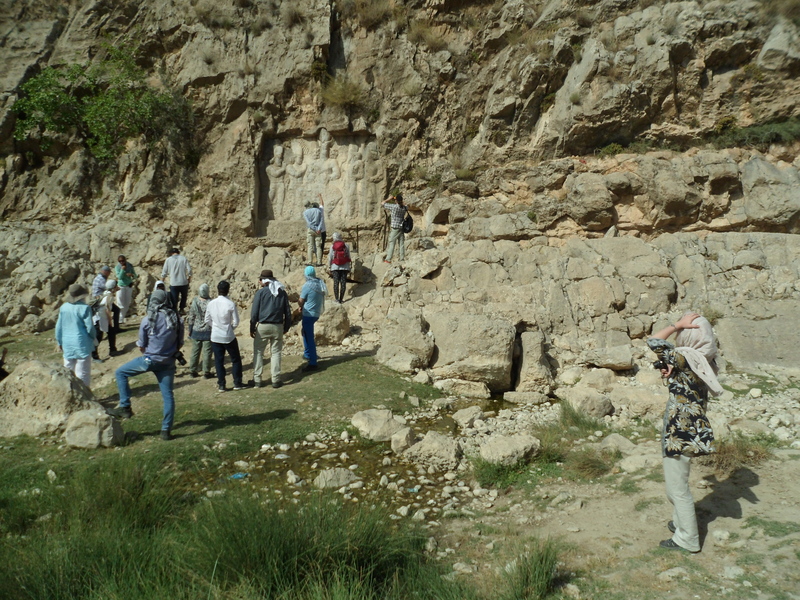 I wish I remembered the name of the relief or the village or the local dignitary who showed us the new clothing workshop which he had opened, but I am a human being and met so many Europeans and Iranians on that trip. As you walk from the highway towards the rocks, the houses acquire gardens with low fieldstone-and-cinderblock walls, and the world becomes verdant and not just the colour of jagged twigs and limestone dust. A sample of the road to the spring. Photo by Sean Manning, May 2016. 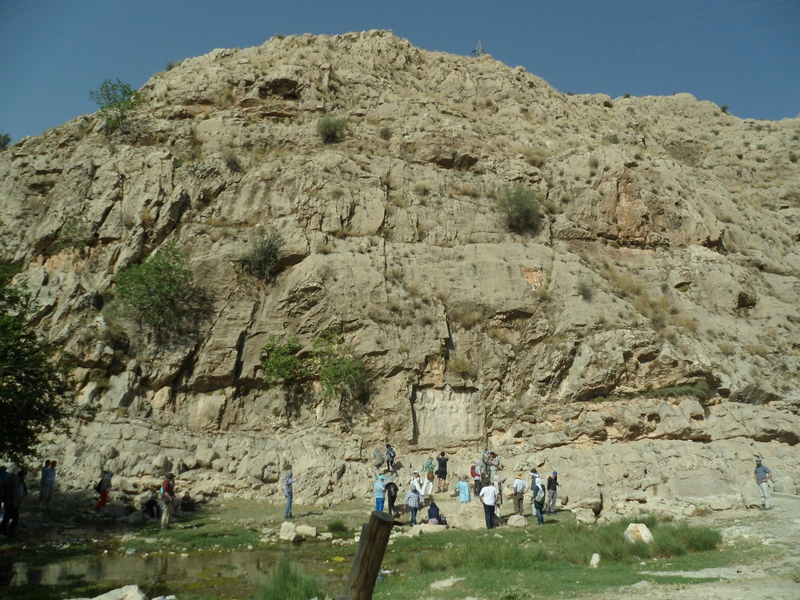 That is because there is a spring at the base of the cliff, and the kings of old chose this spot for a series of reliefs. I suspect that this spot had been sacred for a long time before the first stone-carvers set to work. Iran was probably not always as barren as it is today: 10,000 years is a long time for overgrazing, greedy loggers, droughts and bad winters to strip away the topsoil and leave the remaining ground impoverished. Ancient visitors describe dense woods where now there are just scrublands. 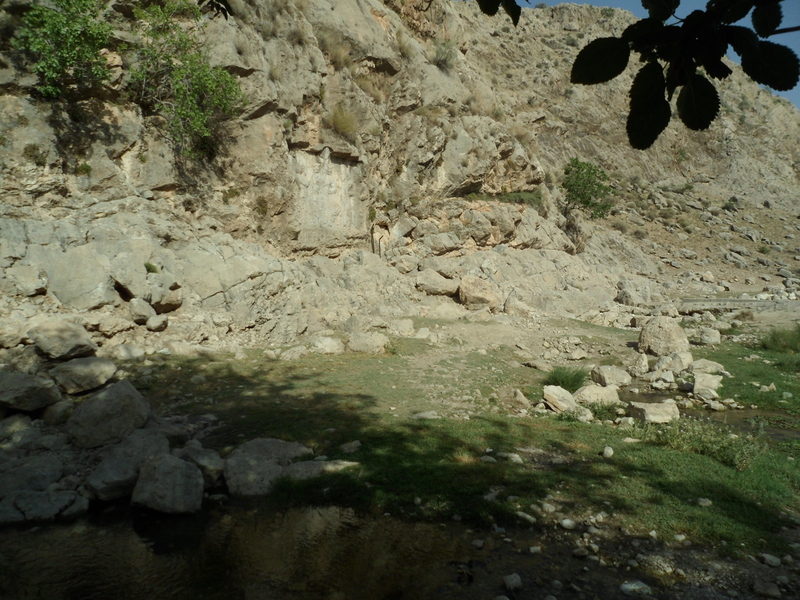 But I don’t think there was ever a time that shade and fresh clean water were not precious in Fars. 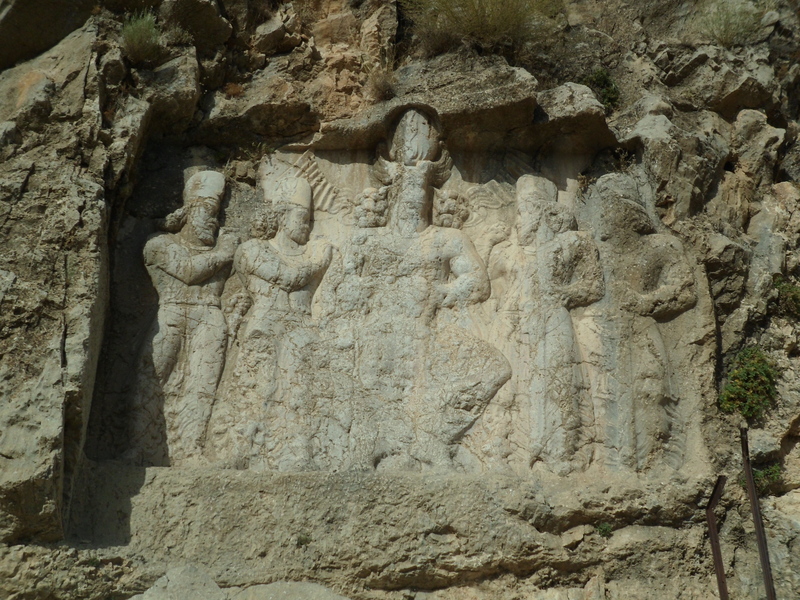 A closer view of the reliefs. The relief higher up on the rocks has mostly been erased, appearing as an orange smudge. I think that the main relief closer to the pool dates to the Sasanid period, as the compositon feels ‘late antique.’ I am pretty sure I have seen a painting of Charlemagne or Justinian in a similar posture. But long after those kings were gone and their reasons had been forgotten, the relief survived because the locals took care of them or at least did not let anyone damage them. The Iranians love bright colours and spraypaint, but I did not see any graffiti anywhere around the pool, just the occasional plastic bag or piece of cast iron. Detail of the ?Sasanid? reliefs. If you can identify them, please say so in the comments! Now, the local villagers don’t have an endowment worth 25 billion dollars, or charge undergraduates $48,000/year to be taught by graduate students. I suspect that most families would be very happy to have 25 thousand dollars in the bank. But they do their best to preserve their local antiquities and are happy to show them to visitors. If Yale does not want to show off its Babylonian collection, perhaps it could lend the tablets to them? I have read that some of the Mediterranean basin and Middle East was much like Coastal BC before people started grazing goats and cutting down forests for lumber and to plant crops. “The Cedars of Lebanon” must have been big trees to make the doors for Solomon’s Temple. Theft of Cultural artefacts also has a BC Connection. Potlatch Gifts were often recycled to build social alliances. The Potlatch Ban that existed from 1884 to 1851 allowed the Government to steal artefacts that in some cases had been handed down or re-gifted for centuries. One first nations cultural interpreter compared Potlatch to Dowries. It was like the obligatory gifts of cloth in South American Autochthonous Cultures. Accepting the gift carried with it an obligation to accept a particular societal bond. The Potlatch Ban was a deliberate policy to destroy those traditional bonds and to take away the cultural artefacts that first nations people used to illustrate the stories of their family lines. One Brit museum says that it “cannot” return the BC 1st nation Cultural Artefacts seized by the Government because of a policy to never sell acquisitions. I wonder if they would make the same claim about Art Work stolen by Germany during WW II, or about something acquired after being stolen from a museum or private collector. I should ask the archaeologists if anyone has done ‘pollen studies’ to reconstruct ancient Near Eastern vegetation like they have in Europe. Maybe those require wet environments to preserve the pollen. The Potlatch “ban” was in effect until 1951, not 1851.